I love welcoming in the New Year by saying goodbye to the one that’s ending. And my favourite way of closing off the year is reflecting back and taking stock. 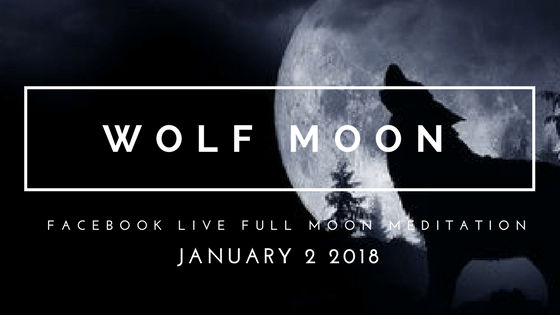 Which is exactly what I’d like to invite you to join me for during our Full Moon live cast on the January 2 Wolf Moon: some powerful releasing, celebrating, and gratitude-giving so we can prepare the way for what we want to create and invite in the new year. Moving powerfully forward into a new year is difficult (maybe impossible) if we haven’t first allowed ourselves to fully process the one that’s passed–if we haven’t acknowledged and released the challenges and disappointments, reflected on and celebrated the victories. Because how can we know what we want to create in the future if we haven’t first considered what did and didn’t work for us in the past? How can we form potent intentions for change if we’re still stuck inside the energy of an old way of being? What beautiful lessons did I learn in 2017? What dreams came true in 2017? What is my soul howling for in 2018? Feel free to journal on these questions in advance, or just ponder them in your heart in preparation for going through them together on the live cast. We’ll hold space for each other as we look back, give thanks, and let go of what no longer serves us…so we can step forward into the new year with grace and strength. You’ll want a notebook and a pen, perhaps a candle and a mug of your favourite tea. Other than that? Just a comfy place to sit, and an open heart. Our circle will gather at 5:45 pm Eastern, 2:45 pm Pacific, 10:45 pm UK on Tuesday, January 2nd. I can’t wait to come together virtually on the year’s first full moon for a beautiful and conscious start to 2018!